One of the things about learning organic chemistry from a textbook is that about 98% of you will never really have to consider the practical aspects of working with many of the reagents that you learn about. That’s OK. While it’s good to get your hands dirty in the lab as an undergraduate, most of you can probably live without working with today’s reagent. Because today’s reagent, diazomethane (CH2N2) is the kind of reagent that you should only handle if you really, really really have to. Nothing gets a chemists’ adrenaline going like a reagent that is 1) acutely toxic 2) volatile 3) extremely carcinogenic, and 4) highly explosive. So many ways to die! But I’m getting ahead of myself here. Let’s talk about the textbook stuff! Diazomethane is actually a really simple molecule. It’s merely a methylene carbon (CH2) attached to dinitrogen (N2). Now as you might well be aware, every nitrogen atoms’ goal in life is to regain the freedom it had as a molecule of dinitrogen (N2), in the earth’s atmosphere – and in diazomethane, this can be attained merely through breaking of a single carbon-nitrogen bond. This makes diazomethane a rather frisky little molecule and highly reacitve in a number of reactions. So what’s it used for? Three things. First of all, carboxylic acids treated with diazomethane will make methyl esters. This is a really simple reaction. See that no heat or acid is required? It just works! Diazomethane will also add to acid chlorides. When the diazo species is then heated, or treated with a metal like silver, a remarkable transformation occurs: nitrogen is lost, and a rearrangement occurs. After addition of water, the net result is that a carboxylic acid has been extended by one carbon. This is called the Wolff rearrangement. How it works: here’s how the reaction of carboxylic acids proceeds with diazomethane. First, protonation of diazomethane by the carboxylic acid gives CH3-N2. This is now a superb alkylating agent, since N2 is one of the best leaving groups there is. 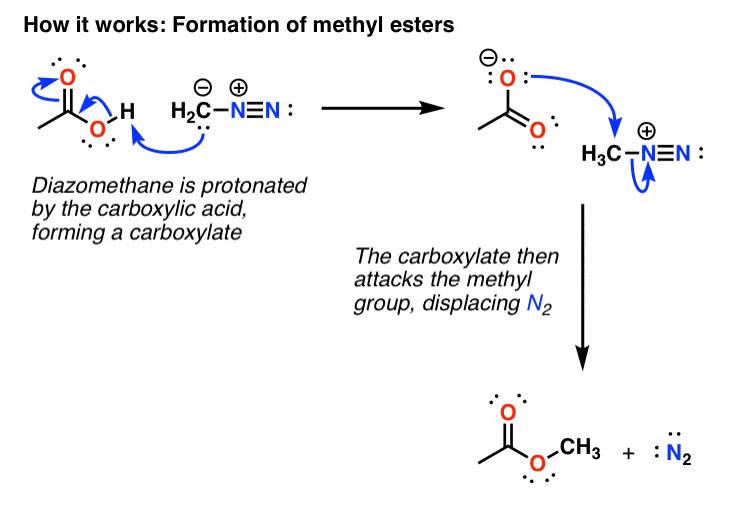 Attack on the carbon by the carboxylate ion (that’s deprotonated carboxylic acid) gives the methyl ester. The Wolff rearrangement is awesome but this post is going to be long enough as it is. You can see the mechanism here. Cyclopropanation is worth talking about. See, when diazomethane is heated or treated with light, something very interesting happens: nitrogen takes the pair of electrons in the N–C bond and escapes to freedom as N2, while the carbon is left with an empty orbital in addition to its pair of electrons. This species – a neutral, divalent carbon with a lone pair and an empty orbital – is called a carbene. Carbenes are fascinating and there isn’t enough space here to give them justice. This carbene in particular (“methylene carbene”) is one of the most reactive chemical species known. Here, it adds to the alkene to form the cyclopropane, although in practice methylene carbene can do all kinds of other funky jazz. The actual use of diazomethane for cyclopropanation reactions is usually a little more complicated, reagent-wise, than is depicted here. Real life tips: Oh man, there are so many. Here’s one: don’t ever, ever work with diazomethane unless you have been trained by someone who has worked with it themselves. Although generally never used neat (it boils at –23 deg C) and typically handled as a dilute solution in ether, diazomethane has a nasty tendency to explode when in the presence of high-surface-area materials (such as ground-glass joints, or, God forbid, metal syringes). If dispensing with a pipet, it’s crucial to flame-polish the edges for safety. Furthermore, diazomethane is acutely toxic: people have died from inhaling it. And if it doesn’t kill you in the short term, there’s always the long term. See, diazomethane, being an alkylating agent, has a tendency to react with (i.e. alkylate) your DNA, leading to base-pair mismatches, mutations, and – eventually – cancer. So why use it at all? Because it’s the best. I confess that the formation of methyl esters from the reaction of carboxylic acids with diazomethane is one of my favorite reactions. You make a solution of your carboxylic acid in ether, dispense the bright yellow diazomethane solution by pipet – slowly – until the yellow color persists, wait about 5 minutes to be sure that all the N2 has bubbled off, kill the excess diazomethane with a few drops of acetic acid, and concentrate. Easiest reaction ever. For some riveting, mouth-agape horror stories of diazomethane in the lab, check out this thread from In the Pipeline : Diazomethane: How Not To Do It. P.S. You can read about the chemistry of CH2N2 and more than 80 other reagents in undergraduate organic chemistry in the “Organic Chemistry Reagent Guide”, available here as a downloadable PDF. The Reagents App is also available for iPhone, click on the icon below! Ah yes, diazomethane. I had a friend in grad school, now graduated, who had to work with it once. He was legendary for his operational prowess in the lab—and diazomethane scared the pants off of him! Notably, diazomethane is also probably the smallest ylide. I like to think of ylides as both nucleophilic and electrophilic at C—that’s why cyclopropanation works, because alkenes are both nucleophilic and electrophilic too (albeit on different atoms). Diazomethane, Simmons-Smith, Corey-Chaykovsky, and even rhodium carbenoids all operate on this principle. I never thought of it as an ylide! but it makes perfect sense. I was more scared by the making of it than actually using it, but it was definitely a two-hands-on-the-flask kind of reagent when you transfer it from the fridge to the hood. I’ve been thinking about this for the past couple of days and did some reading up on diazomethane, but still haven’t been able to figure out why it has a tendency to explode when in the presence of high-surface-area materials or sharp edges. Does it have to do with the increased friction associated w/ high-surface areas and sharp edges? I’m not 100% certain on this, but here’s my best guess. The surface of glass can be mildly acidic due to Si-OH groups. On a surface with enough hydrogen bond donors present you might be able to protonate/stabilize the CH2 and/or displace N2, and the exotherm in doing so may catalyze further reaction. does diazomethane react with alcohols, e.g n propanol ? No, the first step is protonation, and alcohols are not acidic enough to perform this step. Thank you very much for this invaluable support. Many android users we would also love to have thiss type of support on our cell phones, do you plan to relase the app also for android?. Thanks again! I have just find this website some minutes ago. I am a girl from Hungary, and last week I made an experiment with diazomethane, but I do not know, what happened, and I am really curious about your opinion. So I wanted to make methyl chloroacetate, that’s why I solve 1 g chloroacetic acid in 10 ml THF and add diazomethane to that compound. I was waiting for 30 minutes and add 0,5 ml water. Then I evaporate the THF, and what I got was – in the beginning yellow, then really RED thing. I found it very strange, because I had thought the esther will be clear. My teacher check it in MS, and we did not have the molar mass of methyl chloroacetate in the chromatogram. Do you have any idea what happens? I am really excited! Loved your expose’. I have been using diazomethane for…I think 30-40 years (I’m 75, and still in one piece). Use it for pesticide analysis by GC-MS. Love it because it methylates sterically hindered benzoic acids, and phenols at the same time, AND does not affect my non-acid pesticides…so I can analyze them all together at once, when I want to. Discovered and reported that in NIOSH methods NMAM 9201 and 5602. In a method now being written up for NIOSH I evaluated the effects of diazomethane on dozens more of non-acid pesticides. It methylates imides (with an ionizable proton, e.g., acephate), and some keto-enol types (e.g., warfarin). It causes alpha-cyano pyrethroids to racemize around the benzylic carbon. Haven’t figured that one out. These effects are being reported in upcoming NIOSH methods. Couldn’t get it to methylate thio-acids. Have to resort to iodomethane. Fantastic comment. Very interesting. CH2N2 formation of methyl esters is definitely my favorite reaction to run: add, wait for bubbling to stop, then concentrate. Could you share a link to your methods? These later NIOSH methods do not in themselves delve into the mechanism, it just reports the phenomenon as a caution to those using diazomethane in a MRM involving both acids and neutrals. Thank you for creating not only the best organic chemistry website but really the only website that is of any help. I am taking organic chemistry II right now and this site is a lifesaver! It is a better resource than my textbook by far, from the amount of information to the way you explain everything. Just wanted to let you know I really appreciate your work! Why use this reagent when you can just use Fischer esterification? Great question Eric. It depends on scale. For large scale reactions (say a gram or more) the Fischer is probably your best bet for reasons of cost and safety. It’s “set and forget”, come back in a few hours or the next morning and it will be done. However a lot of exploratory organic chemistry is done on 50-100 mg of material (or less!) and in these cases, setting up a Fischer with a Dean-Stark trap isn’t very effective. Having a reagent available such as diazomethane that can quickly and easily (20 minutes !) install a methyl ester on a carboxylic acid is a huge time saver.